This new joint venture will add HCM earthmoving equipment to Acme's fleet, which will be made available through Acme's proprietary re-rental operations to equipment rental companies across North America. Hitachi Construction Machinery Co. Ltd. (HCM) Group has acquired a 33.3 percent equity position in Acme Lift Co. According to Acme, its rental customer base has been increasingly requesting both wheel loaders and excavators on a re-rental basis. “This new partnership with Hitachi Construction Machinery will allow every retail construction equipment rental company in the North American marketplace to have access to a full range of well-proven and highly regarded Hitachi earthmoving products,” said Woody Weld, Acme chairman and chief executive officer. “Acme brings to the venture unique expertise in re-rental of various equipment product classes. Joining forces with Acme furthers HCM's strategy to strengthen its value chain business,” said Yasushi Ochiai, executive vice president in charge of international business for HCM. In conjunction with HCM's equity investment, Acme has restructured its balance sheet to significantly reduce its debt service costs and to provide substantial liquidity to fund its future fleet growth and expansion plans. Hitachi Construction Machinery will support Acme through the utilization of its existing North American distribution channels. Hitachi Construction Machinery intends to expand Acme's earthmoving equipment re-rental business and provide overall business support. Acme will create regional support centers for its equipment rental fleet, serving all the major market areas in North America. Once this operational footprint is established, Acme intends to serve its customers' re-rental requirements from a local rather than national supply base. This will create superior product support and logistical service capabilities closer to each customer and job site. About Hitachi Construction Machinery Co.
Hitachi Construction Machinery Co. Ltd. is one of the world's largest manufacturers of wheel loaders, excavators and mining haul trucks and shovels. 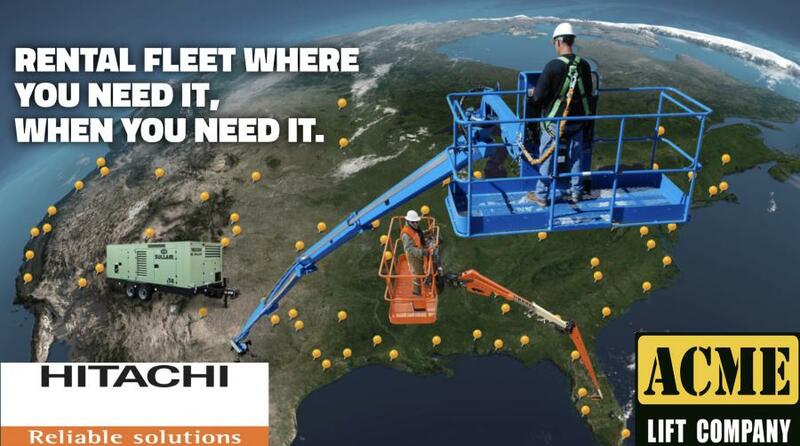 For more information, visit www.hitachi.us/.